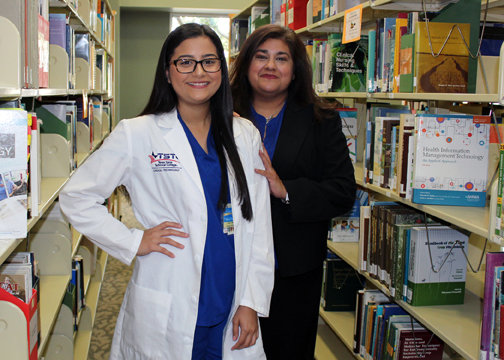 (HARLINGEN) – Missy and Micah Valdez, mother and daughter, are a duo to be reckoned with. Both are students at Texas State Technical College who hold each other to high standards and have high hopes for each other’s success. The journey to TSTC began untraditionally for Missy. She had been in the banking business for three decades and risen to senior bank manager and vice president at a local bank before being laid off in 2017. Wasting no time, Missy used the tuition assistance that was included in her severance package to enroll in the Health Information Technology program at TSTC in Harlingen. But transitioning from a high-level position and six-figure salary to student life was no easy feat. Missy got her dream job as a bank teller straight out of high school and said because of that she never pursued a college education. But despite her fears and the challenges she faces as a full-time student, wife and mother, Missy has maintained a 3.9 grade-point average and earned spots on the vice chancellor’s and dean’s lists. Missy expects to graduate from Health Information Technology with an associate degree in Spring 2019 and will return to TSTC to apply for the vocational nursing and registered nursing programs. The 22-year-old is enrolled in Surgical Technology and hopes to graduate with her associate degree in Summer 2019. She and her mother were no strangers to TSTC before they enrolled. When Micah was in high school, her father underwent open-heart surgery, and she recalls being mesmerized by the staff who nursed him back to health. 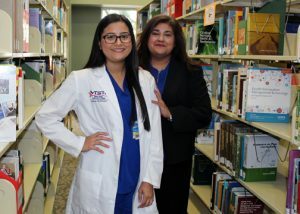 Eventually she received a nursing assistant certificate from TSTC as a dual-enrollment student at Harlingen South High School. The Harlingen native and her father are like two peas in pod. “We do everything together,” said Micah. Micah recently began her clinicals at Valley Baptist Medical Center and said she is excited to begin the journey of patient care. Micah hopes one day to become a surgical nurse. She said having her mom on campus as a peer has made her experience even better. Both women agree that they admire their instructors’ knowledge and experience and enjoy the hands-on training TSTC provides because they know it will help them become the best in their professions. The one thing they wish they could change: not graduating together. “It would be great if we were graduating the same semester. That would be a grand celebration. But at least we only have to purchase one cap and gown,” Missy said with a laugh. For more information on Surgical Technology or Health Information Technology, visit tstc.edu.